Oakham Tree Surgery is a small family run business. We provide a friendly professional service and undertake all types of domestic and commercial work. 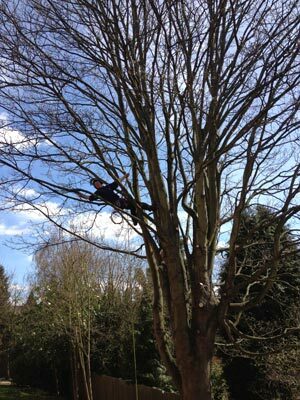 We are fully insured and qualified to NPTC standards in all aspects of tree work. All work we do is carried out to the highest standard with the least inconvenience possible. The site will be fully cleaned after work is finished, all waste will be taken away and 100% recycled. It is important to us to provide a top quality service at competitive prices. The customer's wishes are our priority and we are happy to offer advice free of charge. You will receive an honest assessment of what work is required and a fixed price for the job. Oakham Tree Surgery are based just outside Dudley in the West Midlands and we serve the entire Midlands area. We Undertake work for domestic, commercial, local authority, builders, landlords, grounds maintenance contractors, water companies. We carry 5 million Public & Product liability insurance. Generic and full site specific risk assessments and method statements used as needed. All works are completed to British Standard 3998:1989 ‘British Standard Recommendations for Tree Work’ or higher. We offer a free no obligation quotation at a time convenient to you. 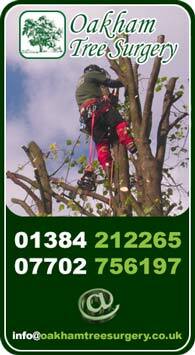 If you would like a FREE no obligation quote for any Tree Work call us on 01384 212 265 or 07702 756197. Alternatively click here and fill in our online form. The service Adam and his team provided was second to none, they fitted around our requirements and offered straight forward advise.